AB InBev is set to trial LNG truck beer delivery in UK. Caption: IVECO. International brewer AB InBev will pilot using a low-carbon lorry to carry shipments of beer from its brewery in Samlesbury, Lancashire. Powered by liquefied natural gas (LNG), it will transport beer brands including Budweiser, Stella Artois, Beck’s and Bud Light. The use of LNG will aim to reduce carbon dioxide (CO2), nitrogen oxides (NOx), particular matter (PM) and noise emissions. This trial will be a first for the UK and will take place over the next two weeks using the new IVECO Stralis NP tractor from transport company H Parkinson Haulage (HPH). The lorry delivers the best fuel efficiency over long-distance journeys when it offers up to 15% improvement in fuel consumption and has the lowest pollutant emissions. The vehicle can carry up to 1,560 cases of beer and will be monitored by AB InBev and HPH to assess the environmental savings it makes. If the lorry shows emission savings in the two week trial, AB InBev has pledged to keep the vehicle on the road permanently. 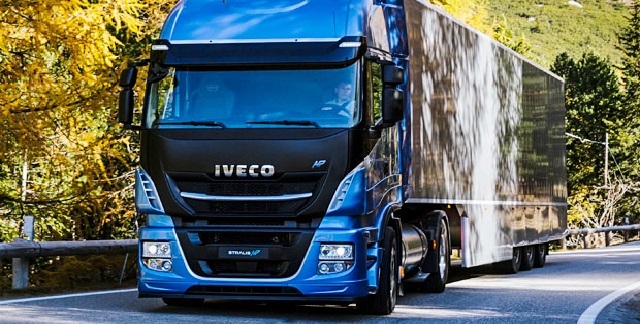 According to IVECO, the LNG lorry is already recognised as an environmentally cleaner alternative to traditional diesel-powered trucks. It achieves emissions reductions of up to 15%-80% of C02, 60% of NOx and 99% of PM, as well as a noise reduction of 19dbs. Samlesbury brewery manager Stanislav Chulkov said: “We are delighted that Samlesbury is the chosen location to trial the pioneering sustainable technology, in a first for AB InBev in the UK. This new initiative is another step towards one of AB InBev’s four 2025 sustainability goals, to reduce 25% of CO2 emissions across the value chain.